Welcome to finish it up Friday and Happy December! I made serious progress on my gingham quilt this week! I debated rushing through the hand binding just so I could have a finish for today, but then the voice of good reason showed up. (Hurray for that! hahaha!) I decided to slow down and enjoy the process instead. I'm currently 1/4 of the way done stitching the binding to the back. I look forward to snuggling up with it as I finish it this weekend. I love hand binding! Anyway.....I do have a small finished project to share with you today! 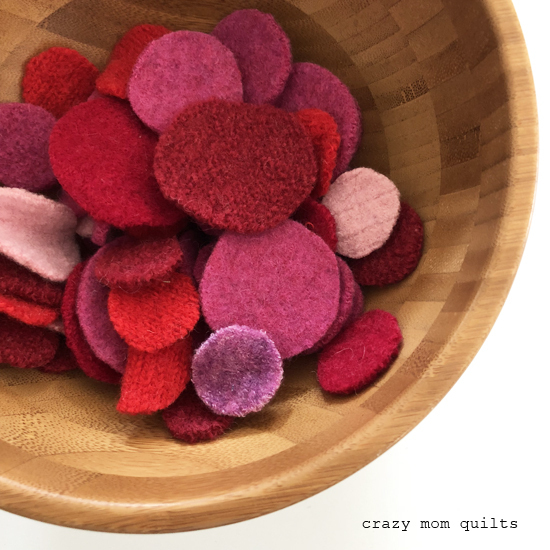 A few years ago my neighbor friend passed along some scraps that her sister-in-law had leftover from making felted wool mittens. Not one to turn down scraps, I adopted them and they sat in my sewing room for quite awhile. I cut circles (freehand, with scissors) out of the wool scraps and they sat in a basket for awhile longer. 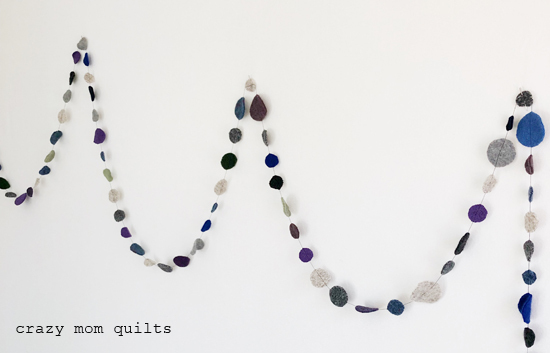 Recently, I separated the cool colors from the warm colors and sewed some of them into a garland. It was so quick and easy...once the circles were cut, that is! I used a 50 weight thread from Connecting Threads (because it's nice and thick) and I stitched them together on my sewing machine. 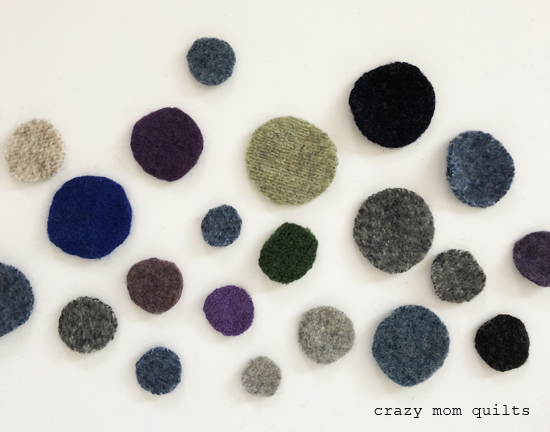 I sewed about 6 "blank" stitches between each wool disk. I made a few garlands...one is about 4 yards and one is 4 1/2 yards long. I discovered that might have been a little bit too long, but I guess I can always trim them, right? I hung one on my mantle and I'm sure I'll find a home for the other one soon. This was such a fun and quick project! These are ready to stitch up and would be perfect for either Christmas or Valentine's Day. Or both! That's it for me today! Do you have a finish to share? If so, please link up. Thank you, as always, for joining me for finish it up Friday! Thanks for stopping by and for reading. I appreciate it so much! Have a great weekend! Love the garland! What a great project. The quilt looks amazing... and the garland is so cool! I love your garland, and am so impressed by the quilting you do on your home machine. 3 cheers for slowing down and enjoying the hand stitching!! I made a cute Christmas garland with felt holly leaves and berries. 1 leaf, 1 or 2 berries, repeat. The hardest part was trimming all the leaves! I would love a WINTER full of hand binding! It is is my favorite part of the quilting making. Too bad I'd have to quilt so many quilts to get a winter's full of it. I really enjoy working with batiks but the hand-binding on the dense fabric really slows me down. But otherwise, I'm like you - I enjoy hand-binding. Makes me feel less guilty about watching tv! It is right and good to savor the stitches and the scraps. Happy, happy, joy, joy! 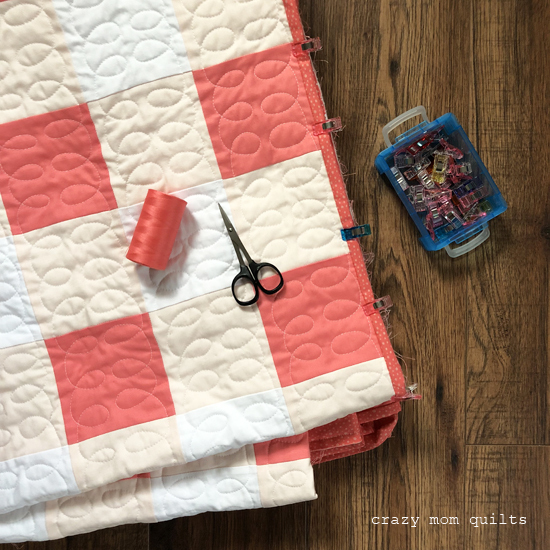 Enjoy finishing the binding on your quilt. Oh those red wool circles would make a pretty non-rotting cranberry garland for the tree, wouldn't they? Last night I sat un-quilting a small baby quilt. Not quite as fun as binding but I gotta admit, not nearly as bad as I was anticipating it would be. I got just past 1/2 way and decided to save the rest for tonight. 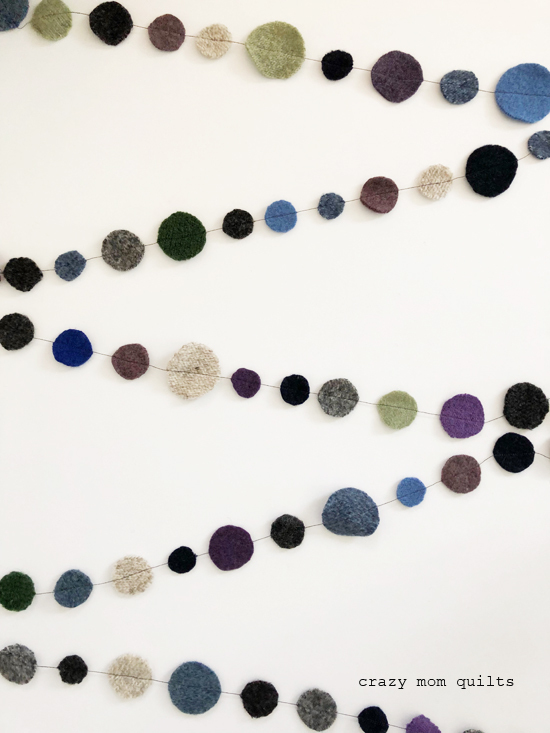 What a great idea, the felted garland. It would be a fun project to do with the older grands. What a brilliant garland idea! And I love your quilting motif. Great job! I'm still in love with how you quilted the loops in a mirror image. Such a pretty bowl of wool scraps! I absolutely love the garland! It's such a fun and creative use of scraps. That is the perfect garland! Yeah for hand-me-downs and someone else's leftovers! That red garland would be perfect to hang I. February! And I have an idea...your readers could send you quilts that need the binding stitched down. I bet you’d have 20 offers within a minute of posting it;) I only bind by machine. It might have something to do with (looking otherwise completely normal) having short sausage-like fingers! A big pile of quilts to stitch binding on sounds good to me. Binding is my favorite part! The garland idea is very interesting! I would never have thought of that. I think it's pretty cool.